There’s a great little day trip awaiting anyone who’s interested in finding a small bit of the wild in downtown Toronto. 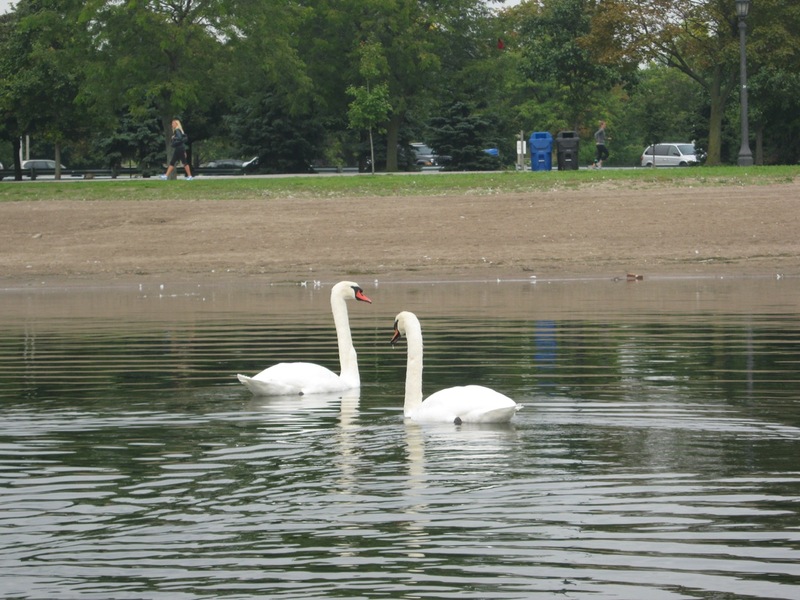 It’s called the Humber River … who knew??? Put in at Étienne Brûlé Park, off Catharine Street just north of Bloor and paddle south to the lake. Lots of cool stuff to see, including imagining what Brûlé, probably the first European to behold Lake Ontario, saw when he arrived at the exact same spot nearly 400 years ago. 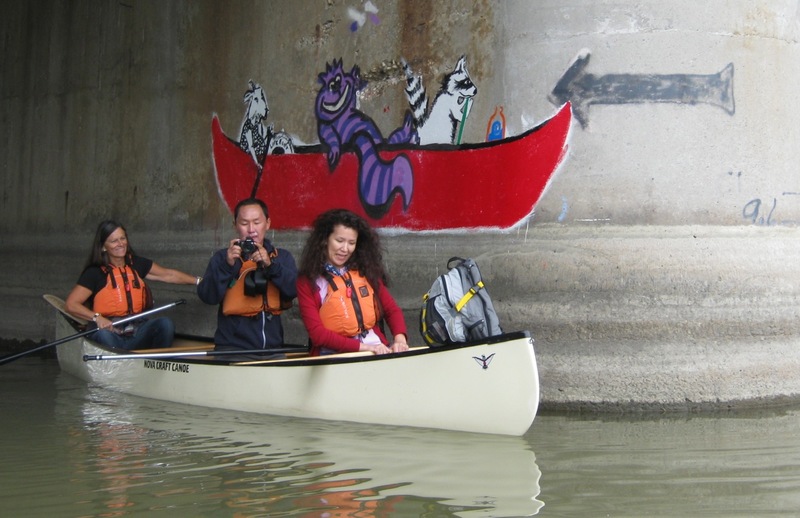 A crew from museum paddled this piece of the Humber on National Canoe Day (it was actually an outing that was sold as a fundraiser at the Beaver Club Gala last fall) in bark canoes. Helping to celebrate was CCM Piper-in-Residence, Helen Batten, who serenaded all and sundry with rousing renditions of the Paddling Piper’s Waltz and the Athol Highlander’s March. 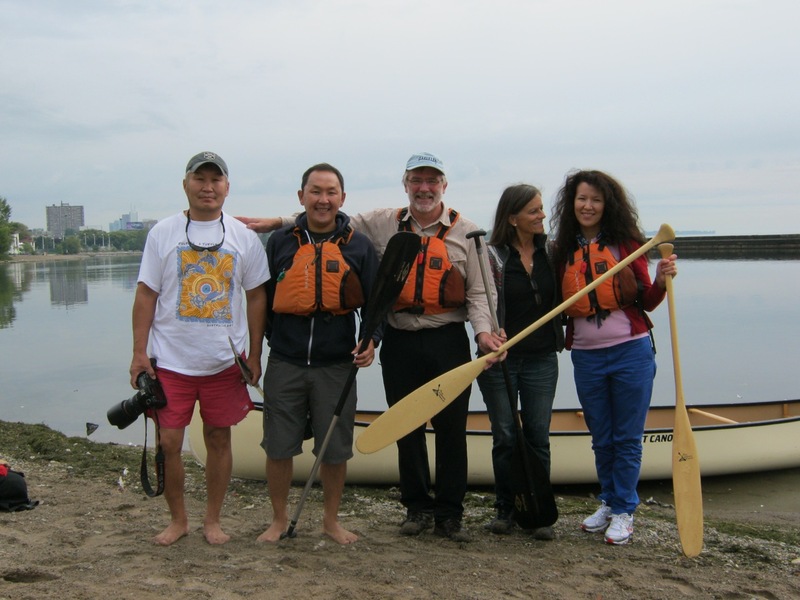 The National Canoe Day Humber Expedition was such a success that when a group of visitors from Siberia were in Toronto in September to celebrate Days of Sakha Yakutia Culture, their first outing in Canada was paddling the mighty Humber. Egor Makarov and his wife Marina had come to Toronto from their home in Yakutsk to launch a book and film about Siberian horses. We met them on Thursday evening for the premier of the film at the Bezpala Brown Gallery where there remains a fine exhibit of Sakha art including a wonderful selection of Egor’s Siberian horse photos. In spite of telling us that he was shy and not used to speaking in public, Egor did a great job answering questions about his film, while a rapt audience sipped wine and munched cheese and other goodies. Egor owns a bottled water company and a restaurant in Yakutsk and spends as much time as he can adventuring in eastern Siberia, throughout the Sakha Republic (the coldest inhabited place on earth). 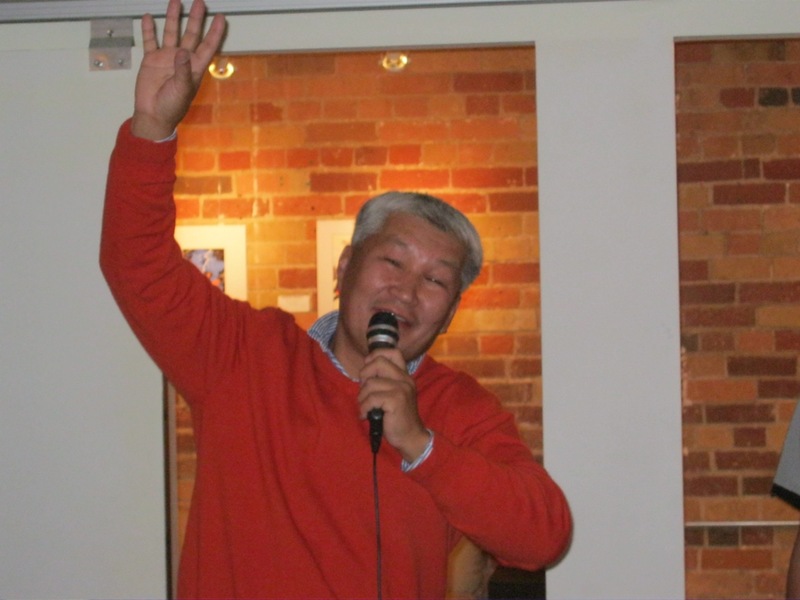 Because he and Marina, along with many others in Sakha, like Slava Shadrin and Ruslan Skribykin, were so very kind to me on two visits to Yakutia over the last eighteen months, I wanted to do everything possible to make them welcome here in Canada. Our original plan was to load up a trailer and pull two canoes and gear for five paddlers to Toronto.However, with help from Roch Prévost at Nova Craft Canoe in London—who connected us to Kelly McDowell and the wonderful hospitality of The Complete Paddler two boats and all the outfitting appeared miraculously at the start of our trip and was picked up afterwards. I can’t thank Roch and Kelly enough for making that happen. 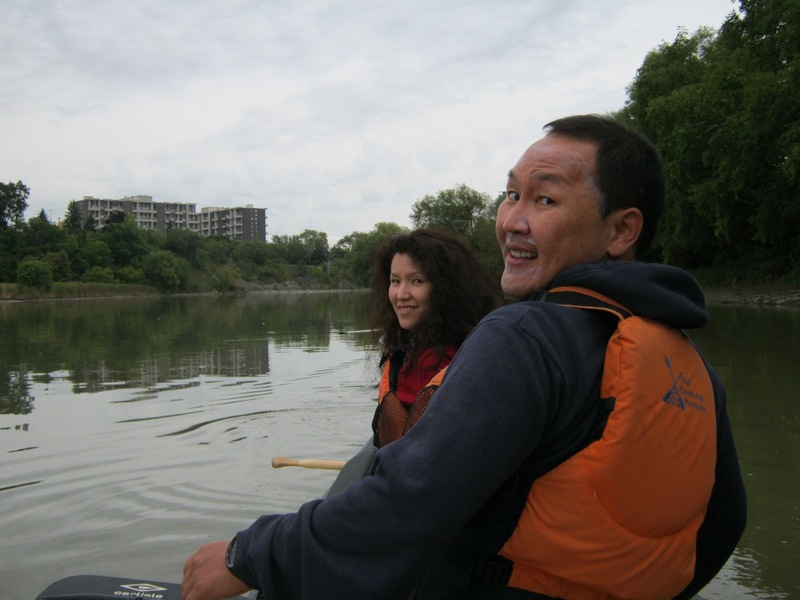 Just like on National Canoe Day, we started at Étienne Brûlé Parkette, just north of Bloor, and had to do a little wading because the water was so shallow. We saw lots of fisherman (who weren’t too happy that we were paddling through their pools) and some BIG fish (maybe salmon, maybe carp). Egor was a little disappointed at the color of the water. The first thing he did when we arrived at the park was put on his bathing suit. But even if the water had been deep enough to swim in (it was later on) he was not inclined to swim because the water looked a bit ‘soupy’ with sediment and who knows what else. But it really IS amazing how this little bit of river in the midst of this huge city actually feels like wilderness. It was full of birds and bird songs. In June, we actually saw a couple of mink and a deer right on the edge of the river. My wife, Gail Simmons, paddled with Egor’s brother, Misha (who came up from Michigan to see his brother and translated for us) and Marina. Marina’s and Egor’s English was about as fluent as Gail’s and my Russian and Sakha so Misha’s intervention made a world of difference in our communications. Even with the language barrier, and especially with Misha’s translation, it all worked out well. Once we all got in and pointed in the right direction, we were away! 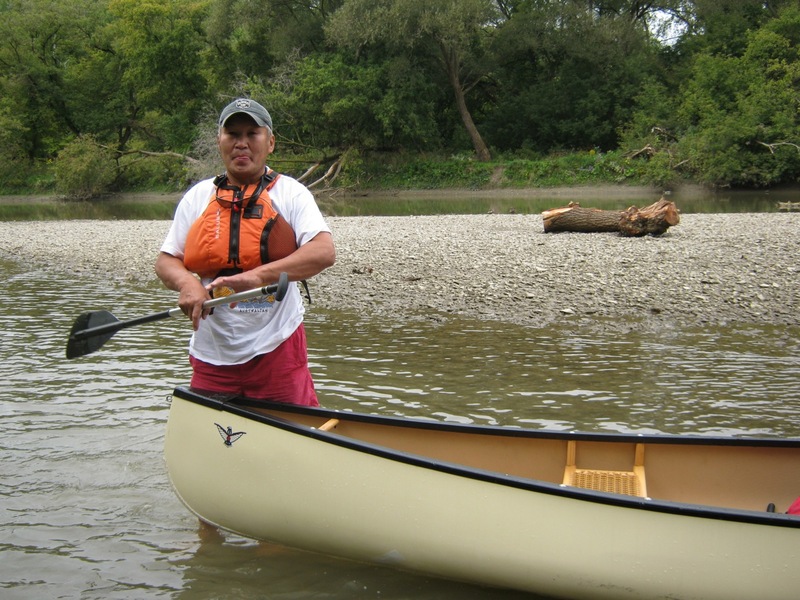 It was a first experience in a Canadian canoe … couldn’t think of a finer craft, or more quality gear, to make that introduction! It was a very happy day for everyone. All in all, it was a great outing. They were intrigued to see the pedestrian bridge at the outflow of the Humber, designed by renowned Spanish architect Santiago Calatrava, which was inspired by Etienne Brulé’s canoe. 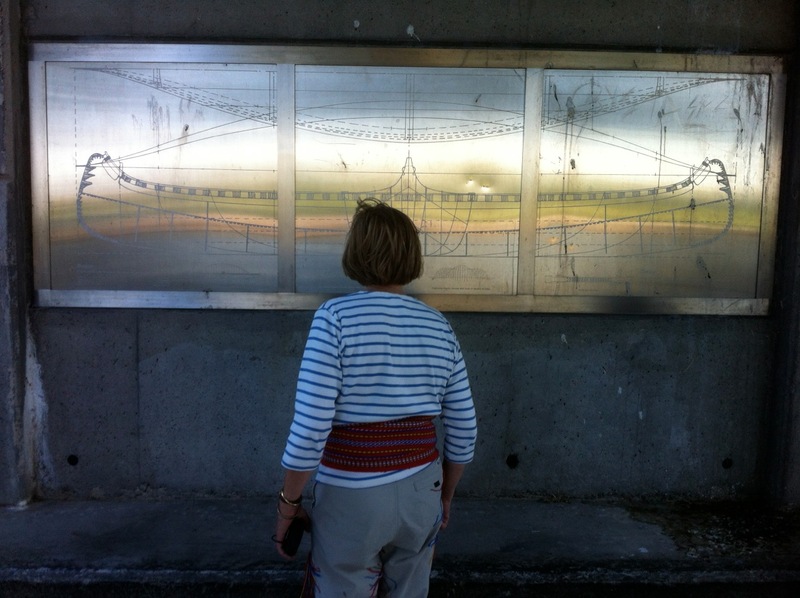 If you walk under the bridge, there’s a plaque that describes how the architect took the lines of Brulé’s canoe and used them to inspire the design of the bridge. This, combined with John McEwan’s “Canoe and Calipers” sculpture we passed at Windermere and the Queensway when we were doing the car shuttle certainly gives the impression that Canadians are as besotted with canoes as Yakutians are with horses. We didn’t have time to take the quick jaunt up to Peterborough to visit the museum but that would certainly be the first stop next time they are in town. When we got to the outflow of the river, we turned the corner onto Lake Ontario to the view of downtown, there was a collective gasp as the CN Tower scene came into focus … the view back to the mouth of the Humber was pretty good too. 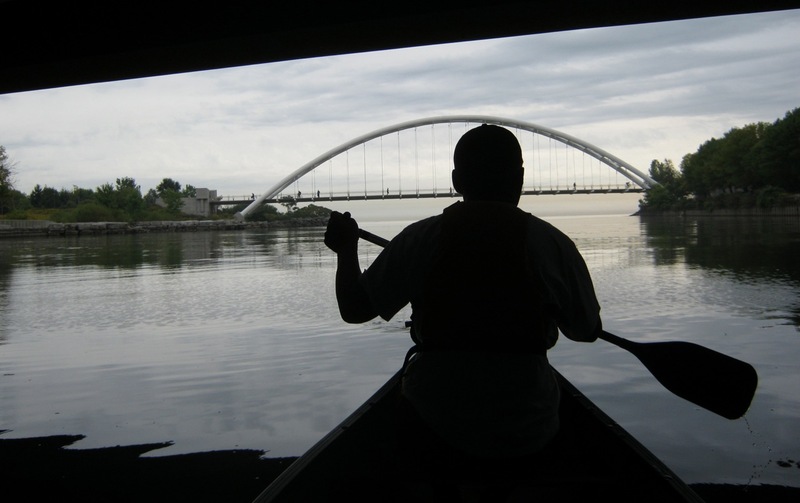 It’s difficult to believe that such an enjoyable day half-day trip on a semi-wild river could happen more or less in the middle of Canada’s biggest city. 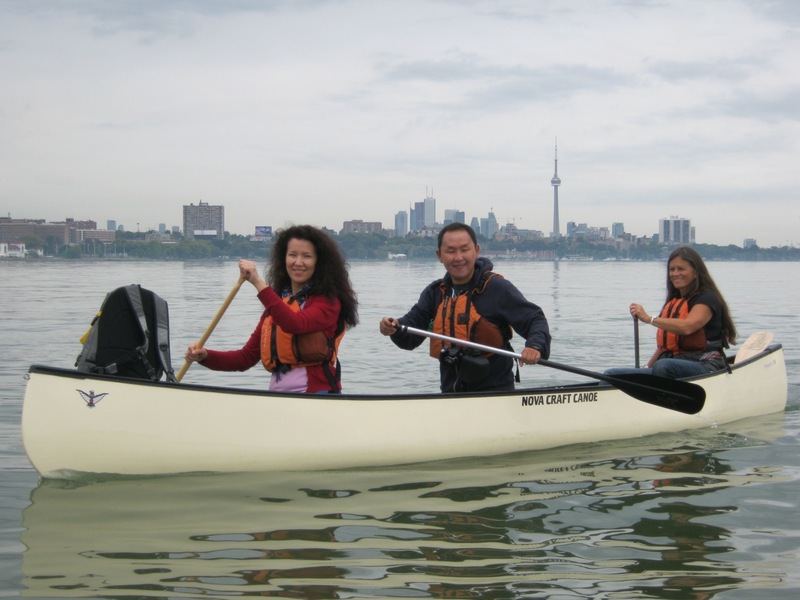 This trip on the Humber was a totally memorable outing for three international visitors thanks to the kindness of Kelly and the gang at The Complete Paddler. Many thanks from all of us. L-R Egor Makarov, Mikhael (Misha) Makarov, James Raffan, Gail Simmons, Marina Makarov.